In a phrase, human trafficking is modern day slavery. The transatlantic slave trade is one of the darkest chapters of American history. With the Emancipation Proclamation, slavery was made illegal and slaves throughout the country were set free. Yet somehow slavery continues to exist. Human trafficking is the organized criminal activity in which human beings are treated as possessions to be controlled and exploited. Slavery looks different today, but it continues to be a multi-billion dollar industry. The most conservative estimates regarding these illegal earnings is 32 billion dollars. That is more than Major League Baseball, the NBA, and the NFL’s earnings combined. Most estimate that the actual revenue from human trafficking is three to five times that 32 billion dollar estimate. When many hear of the 27 million victims of human trafficking, thoughts of big cities and international crime come to mind. There is some truth here. This is a problem affecting almost every country in the world. And, the highest amounts of human trafficking activity does revolve around large cities. However, data shows that this is not simply an issue in other parts of the world. This is something that takes place throughout rural Alabama. Atlanta is a major hub for human trafficking. The interstates that flow through Atlanta then become corridors of human trafficking, distributing victims and services throughout the Southeast. 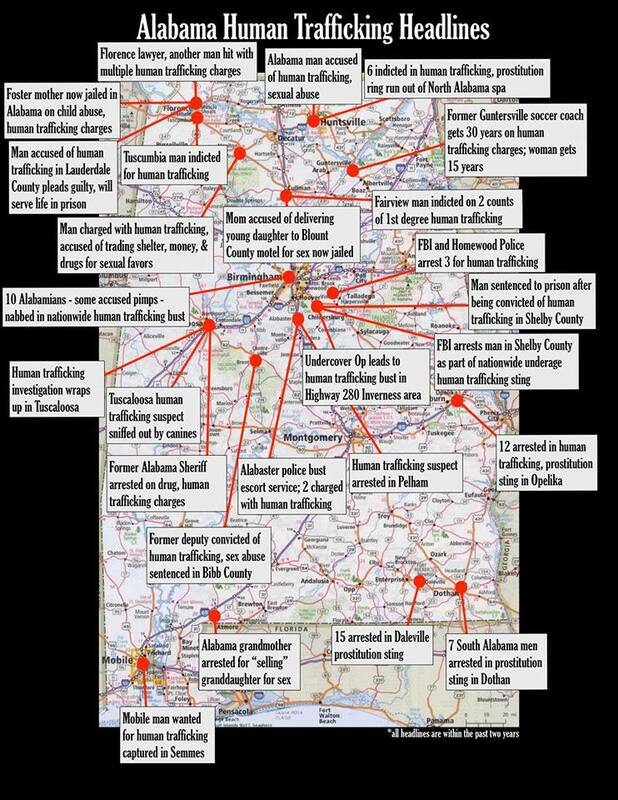 Locally, I-85, I-20, and I-65 have been identified as major thoroughfares of human trafficking. Whether interstates were used or rural roads, 600 victims were rescued in Alabama during 2017. You can see an image listing some of these incidents by clicking here. Approximately fifty percent of those rescued were minors, and experts believe that these numbers represent only about 10% of potential victims. WHAT IS BEING DONE TO STOP HUMAN TRAFFICKING? In order to work to stop human trafficking all of us have to be aware of its existence, be able to recognize the signs that someone might be a victim, and properly respond when we spot it. The State of Alabama has a Governor’s Task Force to combat human trafficking. The middle district region where Chambers County is located has a task force as well. These task forces have been working diligently in a variety of ways to prevent and combat human trafficking. They have also been working to rescue human trafficking victims and help them grow into survivors. In 2016 we at the Circle of Care discovered that not only was our area a major thoroughfare for this activity but that the average age a victim of this industry is first exploited is 12-15 years old. At that moment we decided we had to do something to help combat this locally. We formed the Renew Hope Initiative in order to educate, inform, and train community members and front line workers in issues related to human trafficking. The Renew Hope Initiative’s first activity was a community forum. It was conducted in 2016 that attracted 125 participants. Its most recent project was a training session that provided information specifically for attorneys. Since 2016, local learning and training opportunities have also been provided to local nurses, teachers, police officers, and churches. Everyone has a part to play to end human trafficking. Learning the signs to look for and knowing what to do when you see those signs is key. You can visit www.renewhopeinitiative.com, attend an awareness event, or request an event at your local business, organization, or church to learn more about human trafficking. Raising awareness is vital. Spreading awareness is something everyone can do. And, while it is great to do that anytime, January is Human Trafficking Awareness Month, so it is especially good to help raise awareness at the beginning of the year. Finally learning the National Human Trafficking Hotline number, (888) 373-7888, is another thing everyone can do. To combat human trafficking, it is going to take the awareness and effort of us all. If you would like to request an event or partner with the Renew Hope Initiative’s Advisory Council so that you can promote human traﬃcking awareness, identify, and implement strategies that will “renew hope” for victims and safeguard our children, please contact Adrian Carpenter at the Circle of Care by phone at (334) 768-4091 or by email at renewHOPE@thecirclecares.com.